Elyx, the United Nations’s first digital ambassador, created by the renowned French artist Yak, continues travelling the world to celebrate the UN’s 70th anniversary. Elyx has no nationality, race or gender, and best of all Elyx does not speak, making it a truly universal character. Since August 15, Elyx has visited more than 20 countries and the digital ambassador will continue visiting UN missions and offices across the globe until October 24. 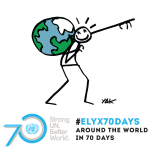 The adventure can be followed on various social media channels using #UN70 and on the official website www.elyx70days.org.